Operators: Makaseev B., Monglovskaya G., Sokolnikov I., Sher B., Ustyuzhaninov L., Lenshin V., Flyangolts R., Khavchin A. The Supreme Soviet of the USSR in the Grand Kremlin Palace. (Moscow). Performers are NK Baibakov, VF Garbuzova. Gala evening in the Kremlin and the awarding of Leonid Brezhnev on the day of 60 th anniversary of the Order of Lenin and medal "Gold Star" (Moscow). Brezhnev during a visit Dneprodzerzhinsk smelter. The battle for the city of Novorossiysk during the 2-nd World War. Brezhnev during a meeting with Walter Ulbricht and Yu Tsedenbalom. Production processes at the Nizhny Tagil Metallurgical Combine. Production processes at Rajchikhinsk coal mine (Amur Region).. Harvesting and types of farms in the state farm "Zarya", Belgorod region. A. Messerer and N. Orlovskaya teach in the National Theater Ballet House of Culture Works "Hammer and Sickle. Soloists of the theater. A scene from the ballet "Aistenok. 1. 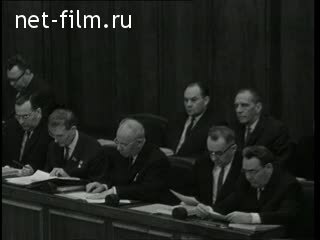 2nd Session of the Supreme Soviet of the USSR. Performers are NK Baibakov, VF Garbuzova. [_] 2. 60 years of General Secretary Leonid Brezhnev. Gala evening in the Kremlin and the awarding of Leonid Brezhnev with the Order of Lenin and medal "Gold Star" (Moscow). Newsreels - Leonid Brezhnev during a visit Dneprodzerzhinsk smelter. The battle for the city of Novorossiysk during the 2-nd World War. Brezhnev during a meeting with Walter Ulbricht and Yu Tsedenbalom. [_] 3. Production processes at the Nizhny Tagil Metallurgical Combine. [_] 4. Coal mining in Rajchikhinsk coal mine (Amur Region)..
[_] 5. Livestock spetshoz "Zarya" in the Belgorod region. [_] 6. "People's Theater of the plant" Hammer and Sickle. "[_] A. Messerer and N. Orel teach in the National Theater Ballet House of Culture Works. A scene from the ballet "Aistenok.